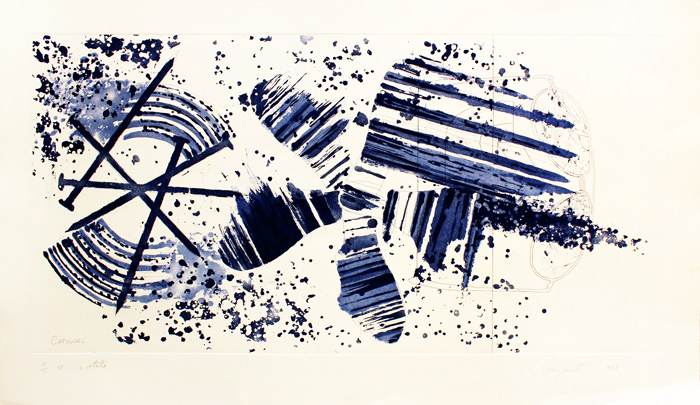 JAMES ROSENQUIST RARE FABULOUS BEAUTIFUL ETCHING. Hand signed and numbered in pencil. Artwork is in excellent condition. Certificate of Authenticity included. Certificate of Authenticity on verso. Estate stamped, dated, numbered and signed in pencil by the Executor for the Keith Haring Estate, Julia Gruen. Artwork is in excellent condition.This item selling in Upscale Art Galleries and Museum galleries when and if it can be found. This item is subject to availability. This is perfect for any elegant home, office, restaurant or place of business. Rosenquist is an American artist and one of the protagonists in the pop-art movement. From 1957 to 1960, he earned his living as a billboard painter. As it turned out, this was perfect training, for an artist set to explode onto the pop art scene. Rosenquist deftly applied sign-painting techniques to the large-scale paintings he began creating in 1960. Like other pop artists, Rosenquist adapted the visual language of advertising and pop culture. Click the button below to add the Hand Signed Carousel (State 2) By James Rosenquist Framed Retail $8.5K to your wish list.